* 5/8 SIZE PC CARD. * MULTIPLE OR CONTINUOUS TRANSMISSIONS. * 256 KBYTE DUAL PORT, FAST, STATIC RAM. * 24 BITS TIME TAG. The CIC429 is a full featured, high performance Serial bus Simulator Analyzer Tester developed by Andor Design for test and simulation of ARINC 429 or similar Avionic buses. 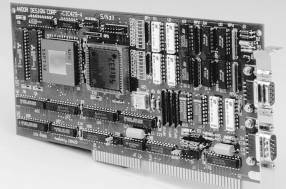 The CIC429 is designed as a 5/8 size plug-in card for an ISA bus. An on board microprocessor off loads the host by organizing the data in a predefined structure in the dual port RAM. Pro­gramming the CIC429 consists of changing this data, which can be done on the fly for real time applications. The CIC429 features four independent transmit and four independent receive channels. Each channel can be programmed for either 32 or 25-bit data format and high or low data rate. Each transmit channel provides a message scheduler for periodic or aperiodic and single or continuous transmission. Transmit messages are programmable for parity, error injection and gap setting. The input to each receive channel can be selected from its own bus or any of the four output channels. Received data words are filtered, time tagged, annotated with a breakdown of detected errors and stored under program control in a circular buffer. The user may define additional circular buffers for each Channel Label and SDI bits. - Minor Frame 16 bits, 80 micro sec. Res. The CIC429 comes with software libraries, drivers and assorted utilities for DOS, Windows and Windows NT. Source code written in "C" is included. A menu driven user interface is included for stand alone operation. With this program the user can schedule and initiate ARINC messages on the transmit channels. He can receive and monitor all or selected ARINC traffic in real time. The user writes a set of Command Blocks, a message list and number of messages to define a Minor Frame. He writes a Minor Frame time, the number of Minor Frames per Major Frame and a Minor Frame list to define a Major Frame. The Major and Minor frames define the peri­odic / aperiodic message schedule. The transmitter sends the Major Frame a number of times as programmed in the Major Frame count, without any further attention from the CPU. The user writes a set of Command Blocks and a filtering table to capture incoming messages. Filtering is defined for each channel per Label and SDI bits. Captured messages are time tagged, annotated with the channel number and a breakdown of any detected errors and saved in the static RAM. An interrupt can be enabled on selected messages. Buffers are assigned by the user for messages of interest per Channel, Label and SDI combinations. An additional dedicated buffer is shared by all messages. Both buffers are circular, the size of the first is user defined. Messages can be stored in either or both under program control. The CIC429 will normally return an I/O channel ready to the CPU in 50 to 100 nanoseconds. This time is extendible to 900 nanoseconds if the CIC429 is accessing the dual port RAM. The CIC429 operates as a 16-bit I/O channel slave device. It generates interrupt flags to show completion of a frame, receipt of a specified Label and SDI Bits, detected message errors or triggers. A dual ported, I/O mapped, static RAM serves as the intermediate for data exchange with the ARINC bus. An auto incrementing address register serves to hold the initial RAM address while a single I/O address serves for data transfer. Both the register and the RAM can be loaded with new data while a message is being transmitted over the ARINC channel. For specialized features or unique interface requirements, please contact the factory. Copyright (c) 1997 – 2007 by Andor Design Corp.